Vedos Verspanende Techniek BV in Venlo focuses on the production of precision components for high-tech applications in sectors such as the medical or the semi-conductor industry. Usage of ROBODRILL milling centres that rotate at 25,000 rpm to get a sufficiently high cutting speed using cutters of 1 mm or even less for mechanical components. 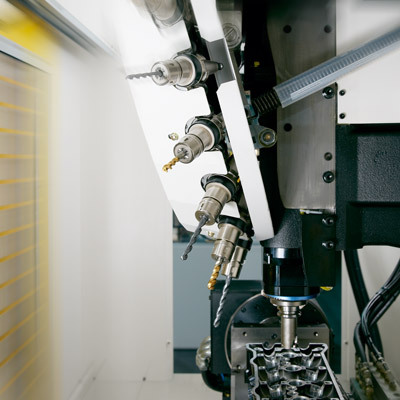 FANUC ROBODRILL provides high efficiency levels that deliver more complex milling work for Vedos’ customers. Small components are produced with a high degree of precision, while off-line programming and quality control are guaranteed as well. Heroic tales from metallurgy are usually about big, heavy ingots and high splinter volumes. But the world of small, precision components also has specific challenges that require a high degree of specialization. Vedos Verspanende Techniek BV in Venlo focuses on the production of precision components for high-tech applications in sectors such as the medical or the semi-conductor industry. During our visit to Vedos, the machines in the workshop are running at full speed. Literally, because the company uses Robodrill milling centres that rotate at 25,000 rpm. This is necessary to still get a sufficiently high cutting speed using cutters of 1 mm or even less. “We are specialized in precision mechanical components”, explains managing director Frank Siepel. “We make sealing rings of a few mm, small screws and other fasteners for applications where a very high precision is required. In electron microscopes, for example, all parts have to be perfectly smooth, with a roughness of less than 0.8. Every unevenness would result in inaccurate measurements in such a microscope. " The small size of the work pieces and the high accuracy requires a specific approach. A high stability is required from the machines to systematically deliver the requested quality. The handling also quickly becomes very specific. The Vedos employees are people with patience and attention to detail. The small products are collected in boxes and strainers. Sometimes they need to be placed in small moulds after running on the milling machines to undergo a second operation. During our visit, one of the employees is using a hook to fish brass rings of a few mm diameter from a small box in which they were captured together with the splinters in the lathe. Each ring left behind represents five Euros in revenue. The company was started by Frank Siepel’s father-in-law 20 years ago. Frank himself arrived on the scene later as a part-time worker but quickly became more and more involved, leading to both gentlemen to aim for a complete takeover. That was in 2015. From the start, the emphasis at Vedos was the lathing of small parts with high precision. “We have 5 lathes, for drilling work and 6 machines with rod supply”, says Frank Siepel. “Gradually we added more Robodrills from FANUC. First we had three-axis machines to finish lathed components. Screws in which a slit should be milled – that sort of thing. Next we took the step to 4-axle machines so that we could also deliver more complex milling work for our customers in an efficient manner. The emphasis is still on small components, but there are many other aspects such as off-line programming and quality control on a coordinate measuring machine." Vedos has 8 Robodrill machines manned by 5 operators. “The oldest Robodrill is now 10 years old and is still as precise as before," says Frank about his choice of FANUC. “Because we work with small cutters, we need machines with a high rpm. The machinery must also be very stable and accurate so that we can quickly change over and yet be assured of the desired quality. Robodrill offers all that." Also important in the choice of FANUC is that the machines are very reasonably priced. “Because they are so long-lasting, the depreciation of the machine in itself is no big cost,” Frank Siepel points out. Thanks to the high reliability, they also have a high availability." For that reason, Vedos also gives a preference to multiple machines, rather than invest in complex machinery for finishing. “A 12-axis machine may perhaps save time in production but then you have to look out that that profit is not lost when configuring it," says Frank. “Ultimately, the cost price per product counts. If I can have two machines running, it is usually more efficient than if we did everything on a complex lathe with propelled tools. We even have customers that have their own milling machines but contact us because our costs are lower."